When I think of April, images of crocuses and daffodils spring to mind, as well as my little boy who will turn four at the end of the month. For others, it may be thoughts of fishing poles and the excitement of opening day. Whether or not your are a pole-bearer, this time of year is excellent for visiting a fish hatchery to meet some of the fish who will make appearances in area waterways this spring and next. Twelve fish hatcheries are run across the state by the NYS Department of Environmental Conservation, while a there are also a handful of private, commercial, and county run hatcheries. Only two of the DEC hatcheries reside within the Finger Lakes Region. The Bath Fish Hatchery in Steuben County was built in the late 1800’s and is one of the oldest in the state. The Caledonia Fish Hatchery in Livingston County holds the title of being the oldest in both the state and the Western Hemisphere. The Caledonia hatchery is the heavy-weight champion for most fish poundage produced per year at approximately 170,000 pounds. The Bath facility follows in second place with 89,000 pounds. Between the 12 hatcheries, one million pounds of fish are released annually into more than 1,200 public waterways by truck, boat and plane. 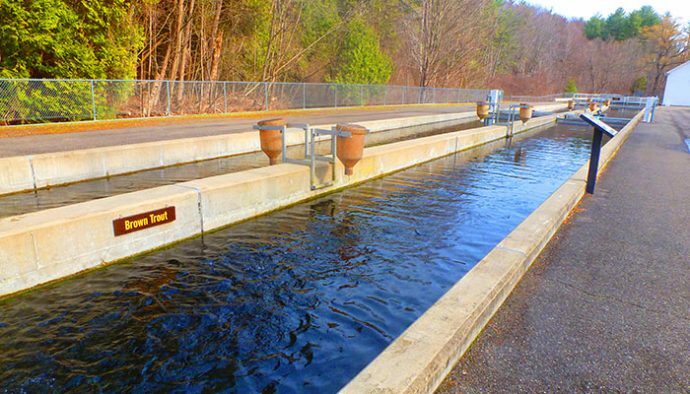 Local bodies of water are stocked from late-March through May and visiting a hatchery during this time affords the unique ability to view the fish in various life stages. As a special outing, I took the kids to visit our closest facility on Fish Hatchery Road in Bath. When we arrived, we were delighted to find a display pond stocked with colorful adult trout that appeared to watch us expectantly. A dispenser that puts out fish food for a quarter stood nearby and my kids loved watching the large fish splash around as they vied for the pellets thrown in. In an indoor space that doubles as the visitors center, rectangular concrete ponds, called raceways, were full of small fry (<3 in). Outside in larger raceways, fingerlings (3-5 in) and yearlings (5-9 in) darted back and forth as our shadows fell across the water. We also had the good luck of catching scientists monitoring the yearlings by weighing them in a metal tub and then comparing the total weight against the number of individuals weighed. This data gives the scientists information on fish growth rates and allows them to determine how much feed is needed. After our visit, I know that when April rolls around again in the future, images of spring flowers will jump to my mind as will thoughts of glistening, speckled bodies that glide through the area streams and waterways. For more information on fish stocking by the DEC, visit dec.ny.gov. For more information on visiting the hatcheries, call the Bath facility at 607-776-7087, or the Caledonia facility at 585-538-6300.